The Dead Sea is dying: How sinkholes, habitat destruction, and low water levels are destroying the Middle East’s most famous body of water. Sinkholes. Habitat destruction. Perilously low water levels. Can a dying sea be saved? 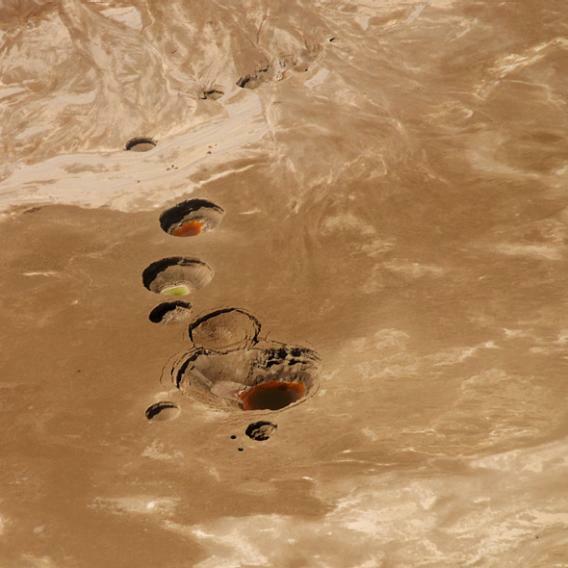 Once covered by water, this former site of Numeira Salt Industries near Haditha, Jordan, is now riddled with sinkholes. EIN GEDI, Israel—Ten years ago, during a routine early-morning solo tour of the area surrounding his kibbutz, Ein Gedi, on the shores of the Dead Sea, geographer-geologist Eli Raz heard an ominous rumbling noise. Raz, who is widely considered Israel’s foremost expert on sinkholes—those terrifying crater-like holes that open up without warning—immediately knew that he was about to be swallowed up. Sitting in his windowless, cramped office on the kibbutz, Raz, 70, a wiry, sun-wizened man with thick silver hair, tells his tale calmly. “I fell in, tumbling down, deeper, deeper. I thought I’d be buried alive. Instinctively, I started to dig upward, and realized that I was lucky—not much earth had fallen in, and I had landed on a sort of ledge. I could breathe. As the dust settled, I could see the sunlight at the top. But climbing out wasn’t an option—I was afraid the hole would collapse on top of me. I was even afraid to move. Sinkholes along the Dead Sea. After 14 hours, the kibbutz rescue team found Raz and extracted him from the sinkhole, which was nearly 27 feet deep. He was dehydrated, and his muscles ached from crouching for an extended time in the same cramped position, but otherwise he was unharmed. It took a few days before the irony dawned on him—the Dead Sea had taken its revenge on him, of all people. The Dead Sea is known by many names: In Hebrew it is Yam Hamelach, the Salt Sea; in Arabic it is al-Bahr al-Mayyit, the Dead Sea and also Bahr Lot, Lot’s Sea. Spanning more than 60 miles through Israel, the West Bank, and Jordan, it sits 1,388 feet below sea level and is the lowest place on the surface of the planet. The appellation “sea” is a misnomer: It is technically a lake at the end of the Jordan River. Its waters are salty, not because they are seawater, but because there are no outlets, and untold quantities of minerals, including salt, have been deposited there. The Dead Sea, in fact, is more than 10 times saltier than the northern Atlantic Ocean, making it unable to support any life other than microbes. The sea has survived for millennia thanks to a steady equilibrium between water flowing in from the Jordan River and water evaporating out in scorching heat that, on summer days, often tops 120 degrees. This equilibrium between water flowing in and out was maintained as long as the region was sparsely settled, as it has been throughout history. Thought to be the site of the biblical Sodom and Gomorrah, the basin and surrounding hills attracted fanatics and hermits, believers and contemplators, but never in great numbers. A temple high up in the hills overlooking the sea dates back to the Chalcolithic period (between 4500 and 3500 BC). At the beginning of the Common Era, the mysterious sect of Essenes set up their community in the remote region, leaving behind the Dead Sea scrolls buried in jars in nearby caves. Not far away, on the rocky plateau of Masada, Herod the Great built palaces for himself, and in 73, 960 Jewish zealots committed suicide en masse rather than submit to Roman rule. * According to first-century historian Josephus Flavius, Emperor Vespasian threw chained slaves into the body of water to test its legendary buoyancy. Fortunately the salt-laden heavy water kept them afloat. Later, Byzantine monks built their monasteries here, Crusaders their castles. But over the past 50 years, increasing numbers of people and industries have been drawn to the Dead Sea’s environs. Even more of a problem, the combined population of Jordan, Israel, and the Palestinian territories has nearly quadrupled from some 5.3 million to more than 20 million. These countries—plus Syria and Lebanon—have tapped the Jordan River and its tributaries, and the Dead Sea has paid the price. A few generations ago, more than 343 billion gallons of fresh water rushed from the Kinneret (also known as the Sea of Galilee) through the Jordan into the Dead Sea; today, fewer than 26.4 billion gallons trickle in. Israel’s largest water project, the National Water Carrier, diverts water from the Kinneret that would have fed the Dead Sea to supply the center and the southwest of the country. Jordan, through its King Abdullah Canal, reroutes more than 90 percent of its share of the Jordan River to farmland, taps, and bathrooms. Then there’s Syria, which siphons off water from the Jordan’s northern tributary, the Yarmuk River. At the same time, the Israel Chemicals Company and the Jordanian Arab Potash Company located on the southern rim of the Dead Sea pump out giant amounts of water to fill the evaporation pools needed to extract minerals, primarily potash and magnesium. This alone, experts say, is responsible for about 30 to 40 percent of the decrease in water levels. Receding waters, as seen from Masada. The ancient fortress city stands on a rocky plateau at the western edge of the Judean Desert. Unlike the Hula Valley, the Dead Sea is not completely under Israeli jurisdiction, and the cause of its ills cannot be blamed on one nation alone. In a region known for its political tensions, possible remedies are entangled with international complexities. So as experts, politicians and diplomats argue over its fate, little is being done to keep the Dead Sea alive. And doing nothing, warns Tal, is the worst alternative of all. There are more than a dozen dangerously gaping sinkholes in this area alone. The beach cabanas have tipped over and collapsed. Once-lush greenery planted by kibbutz members has dried up; only a few intrepid Sodom Apple trees, with their delicate geometrically patterned flowers and strange, puffy, and poisonous fruits, hang on. Although no one has yet died in a sinkhole in Israel, there have been several serious injuries, and sinkholes are a direct threat to tourism, the main livelihood of the kibbutz and the entire Dead Sea region. Currently, tens of thousands of tourists visit every year, splashing in nearby freshwater pools, floating in the salty sea and slathering themselves with mineral-rich mud. Tourism makes up about 40 percent of the income of the half-dozen flourishing Jewish communities along the northern edge of the Dead Sea, most of them set up after Israel conquered this part of the West Bank in the Six Day War. Jordan is also investing heavily in tourism in the region, and the Palestinians have plans to develop hotels and health spas in their future state. Sinkholes are also threatening agriculture—mostly date farming—in the region, another major source of revenue for kibbutzim, such as Ein Gedi. Raz points to a date orchard on the other side of Highway 90, also abandoned because of sinkholes. The trees still stand tall, but, without water, the sun has burned them black. “It’s sad to see an abandoned orchard,” says Raz. Salt crystals along the Dead Sea shore. At the southern edge of the Dead Sea, five-star resorts and spas, such as Le Méridien and the Prima Hotel’s Spa Club, are also at risk—of flooding. 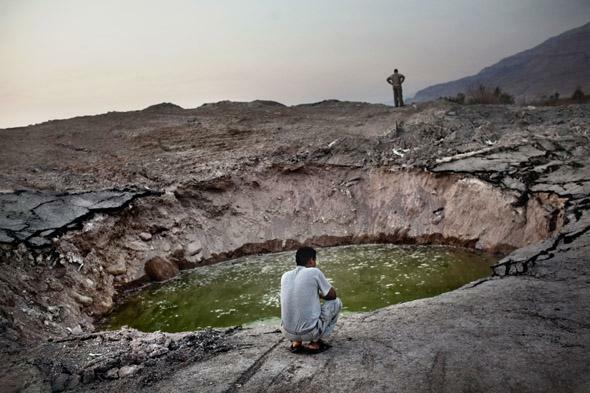 They are not far from mineral companies such as Israel Chemical’s Dead Sea Works, where the potash extraction process creates an unwanted byproduct: Huge quantities of useless salt sink to the bottom of the evaporation ponds, causing water levels to rise. 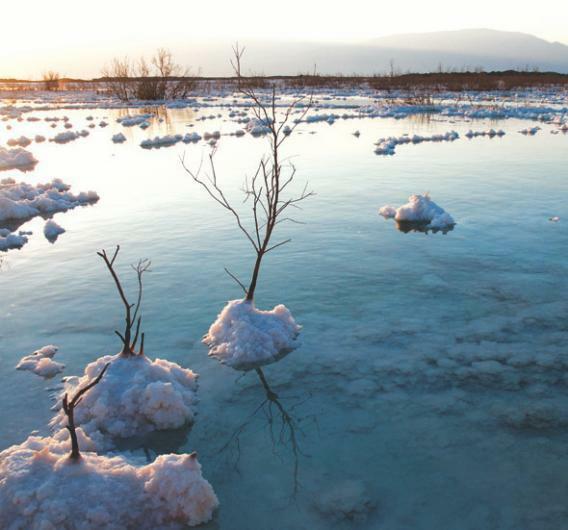 Several years ago, hotel owners on the Israeli side sued the Dead Sea Works and the Israeli government; as part of a settlement, the companies agreed to mine the salt to lower the water levels. The process, estimated to cost well over a billion dollars, is supposed to begin next year. But it’s still not clear where the salt will be dumped. 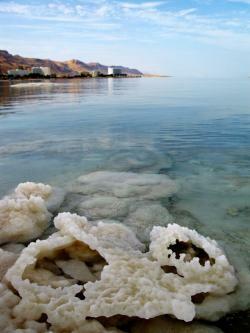 If it dies, the Dead Sea will also kill its unique natural habitat. Although the water is barren of most life, the surrounding ecosystem includes springs that support a surprisingly rich range of flora and fauna. One such oasis is Einot Tzukim Nature Preserve—more often referred to by its Arabic name, Ein Feshkha, and also known as the “Concealed Preserve.” Located in the West Bank and under Israeli control, it is open to the public only at pre-arranged times. Here, some 160 underground springs run down from the Judean hills and bubble up to the surface, forming sweet-water pools where fish swim quietly. Rushes and sugar cane wave in breezes cooled by the pools, which are ringed by tamarisk trees and other native plants. Kingfishers, a sharp stripe of turquoise against the haze, dive for food. 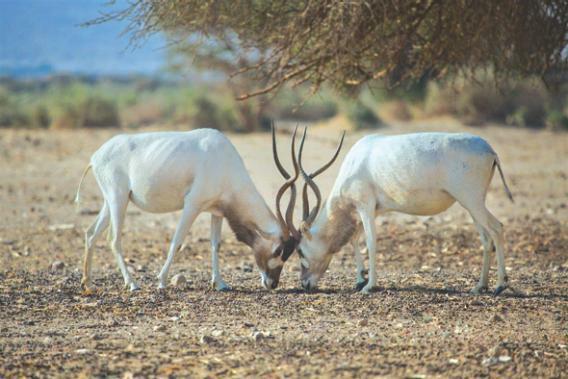 Ein Feshkha is a major migration path for birds through the Middle East; some half a billion birds pass through here each season, according to Ariel Meroz, a geology student at Hebrew University who works as a Parks Authority guide in the preserve. The birds are not alone. Numerous varieties of bugs and invertebrates have adapted to life here, and ibex, hyrax, wild boars, desert cats, hyenas, jackals, and wolves come to drink from the pools. Until recently there were leopards here too, as well as in the neighboring oasis of Ein Gedi. Most famously, the leopard of Ein Gedi—Shlomtzion, affectionately named for Jewish queen Salome Alexandra—prowled here for 16 years. Shlomtzion died in 1995, and no one has sighted a leopard since. Ibex and other animals roam the nearby mountains. Hundreds of species of insects and birds are native to the region as well. How can an environmental catastrophe be averted? One possibility under discussion is a massive public works project on a scale rarely seen on the international scene. This year, the World Bank presented a bold plan to replenish the Dead Sea with water from the Red Sea, south of Israel. The idea of a canal linking the Dead Sea to either the Red Sea—known as the Red-Dead—or the Mediterranean—the Med-Dead—dates back to 1899, when Abraham Bourcart, a Swiss engineer and a Christian who enthusiastically supported the Zionist dream, suggested a Med-Dead canal to Theodor Herzl and the World Zionist leadership. The idea has surfaced numerous times over the years. In 1977, facing the oil crisis, the Israeli government even appointed an official committee to come up with operational plans. But nothing ever materialized. The canal plan was resurrected at the 2002 Earth Summit in Johannesburg, South Africa, when Israel and Jordan announced—to the great surprise of many, including members of the Israeli government—that they would be turning to the World Bank to prepare a comprehensive report, including a feasibility study, an environmental study, and a social assessment, for a trilateral plan with the Palestinian Authority for a Red-Dead conduit. It took years to organize, raise the money and conduct the feasibility study, but the Red-Dead project as put forth in the 2013 World Bank proposal is both conceptually simple and astoundingly complex. 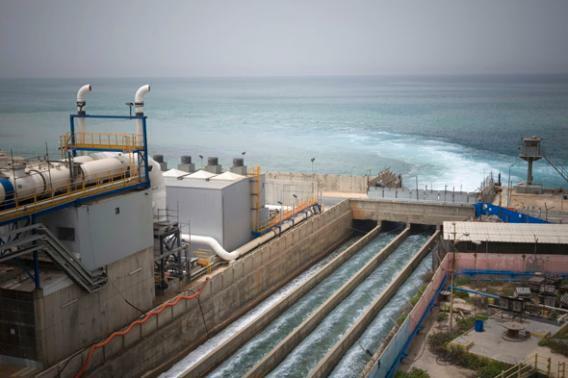 It calls for annually pumping up to 528 billion gallons of water through 111 miles of tunnels and pipes on the Jordanian side from the Red Sea to the Dead Sea. Hydraulic stations would take advantage of the height differentials, and desalination plants would provide potable water for Jordan, the West Bank, and Israel, while the remaining briny water would be pumped back into the Dead Sea to raise its level. A view of a new desalination plant is seen in the city of Hadera, Israel, Sunday, May 16, 2010. 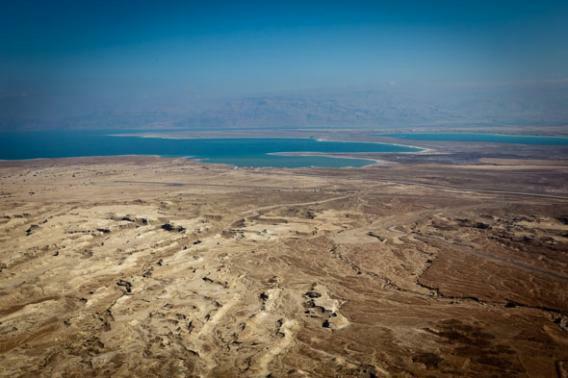 It would seem to be a win-win-win scenario, but environmentalists warn that the Red-Dead, rather than healing the Dead Sea, just might serve as its death knell. They are ringing an array of alarm bells: One is that mixing the waters could result in an algae bloom that might give the Dead Sea a reddish hue. Another is that a coat of white gypsum would form on the top. Although the ecological effects of these chemical changes are still unclear, they would likely diminish the sea’s tourist appeal. A third concern is the high frequency of earthquakes in the region between the Red and Dead Seas: Seismic activity could cause salt water to leak into underground fresh water aquifers. “Why not simply introduce water conservation, rather than a multibillion dollar pipeline project that will cause irreversible damage?” demands Gidon Bromberg, the Israeli head of Friends of the Earth Middle East (FoEME), a joint Israeli-Jordanian-Palestinian environmental group. But he acknowledges that this is easier said than done. Changing public behavior is a long-term process—and of little interest to most politicians. “They would much rather be seen cutting a ribbon over a grandiose plant than over a toilet that uses grey water,” he says cynically. Eli Raz doesn’t like the plan either. He’d prefer to see the Dead Sea’s problems solved by rehabilitating the Jordan River and utilizing desalination to supply a larger percentage of water to Israel’s densely populated Mediterranean coast. But this would require a systemic, cooperative regional approach to water sharing—which is about as scarce as water in this part of the world. The Israeli and Jordanian governments both officially support the Red-Dead. The Jordanians are so gung ho that they announced in August that they are pressing ahead with parts of the project on their own. The Palestinians, however, insist that they are being ignored and deprived of their rights. Water has been a source of ongoing conflict between Israel and the Palestinian Authority, since Israel controls the major renewable water resources throughout the West Bank. Although the Oslo Accords of 1995 provided for Palestinian access to water sources, the arrangements were never implemented by either side. The Palestinian demands are “not something that we are discussing,” says Maya Eldar, an advisor to Israel’s Regional Cooperation Minister Silvan Shalom. In fact, the Israelis can’t even agree among themselves. Shalom is a fervent supporter of the Red-Dead, while Environmental Protection Minister Amir Peretz just as fervently opposes it. But even if environmental issues and diplomatic squabbles could be overcome, the cost of the Red-Dead—an estimated $15 billion to 17 billion—is prohibitive. According to the World Bank feasibility study, the economic viability of the project is dependent on international grants totaling $5 billion, and Jordan must raise an additional $2.5 billion in loans to pay for bringing the desalinated water 124 miles to Amman, which is 3,280 feet higher than the Dead Sea. Only then will the private sector kick in the remaining $2.6 billion. And after all that, the cost of the desalinated water in Jordan could be so high that it would have to be subsidized by the government. Given the current world financial constraints, such funding is doubtful. Jordan’s financial resources are strained by the thousands of refugees from the Syrian civil war fleeing into the country. In its current state, the Palestinian Authority is unlikely to receive grants or loans like this, and Israel certainly cannot pick up the tab—or even the loans—on its own. Salt crystals surround trees and other plants in the shallow waters. The water’s 33.7 percent salinity can’t support life other than microbes. This article originally appeared in Moment magazine’s September/October issue. Moment magazine is an independent bimonthly of politics, culture, and religion, co-founded by Nobel Prize laureate Elie Wiesel. For more go to momentmag.com. Correction, Sept. 18, 2013: Due to a Moment production error, this article originally misstated the date of Masada. It was 73 C.E., not B.C.E.